Acute abdomen not so "cute" when you have to diagnose it? If tapping an abdomen and looking at in-house cytology isn't right up your alley, you're missing out on some VetGirl fun! 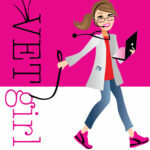 In this 2-hour VetGirl webinar we reviewed emergency management and treatment of the acute abdomen. We reviewed the pathophysiology, clinical signs, etiologies, clinical diagnosis (e.g., using lactate, glucose, creatinine of abdominal effusion as compared to peripheral blood), and overall treatment of patients with acute abdominal pain. A case-based approach was utilized and we reviewed several common disease processes such as uroabdomen, bile peritonitis, and septic peritonitis.